So, we finally know the result of this year's Best Animated Feature category at the Oscars. After months of speculation it was Disney's Big Hero 6 that took home the big prize. This year's award has been pretty controversial in the wider film community, mainly due to the Academy's failure to nominate The Lego Movie. Inside the animation community however, the nominees have been warmly received and seen as reflective of an extremely strong year in the field of feature animation. The end result has nevertheless seen some murmurs of discontent, with Big Hero 6 seen in some quarters as the safe option. Certainly, it's win has done nothing to dispel suspicions that the average Academy voter neither knows nor cares about the art-form. In the run-up to the last two year's ceremonies, Hollywood Reporter has carried out anonymous interviews with Academy voters. and discovered a shocking (although perhaps not surprising) disregard for various categories, not least the animated categories. They showed what Cartoon Brew described as 'aggressive indifference' towards the subject, and most infamously one particularly pleasant seeming fellow dismissed Song Of The Sea and Princess Kaguya as "freakin’ Chinese [??] f**kin’ things that nobody ever freakin’ saw". The theory goes that the average voter will just go for Disney or Pixar by default, even if they haven't seen the other nominated films. In such a context, films like Kaguya and Song Of The Sea never really stood a chance. But is it really as bad as all that? I decided to look into the history of the award and try to put this year's result in context. Note that until last year, Disney Feature Animation had yet to win the category in their own right. The big winners, however, are Pixar, having won seven times (out of nine nominations in total). Those years they won? With the exception of Brave, it's generally agreed that they were worthy winners. In retrospect, Monsters Inc really should have taken the first year over Shrek too. Outside Pixar though, things are a little less predictable. There's been one Dreamworks film, one Studio Ghibli, one Aardman animation, one Warner Bros and one Paramount film. It's easily forgotten the Academy awarded Rango and Happy Feet, when you're trying to argue that the category is just the Disney/Pixar award show. Those two were surprises at the time, and serve as a nice reminder that upsets do happen. And in years where there is one universally lauded animated film such as Spirited Away and Wallace and Gromit, the Academy awarded them too- regardless of what studio produced them. If the academy as a whole is wilfully ignorant about animation, those tasked with selecting nominees in the field each year are certainly not. The list of nominees is much more interesting than the list of winners, with wonderful films such as Chico & Rita, Persepolis and Ernest & Celestine rubbing shoulders with high-profile big studio-fare. With smaller films such as these (and Kaguya and Song Of the Sea this year) the nomination is a boon, shining a spotlight on them and drawing attention on them they might otherwise have not had. 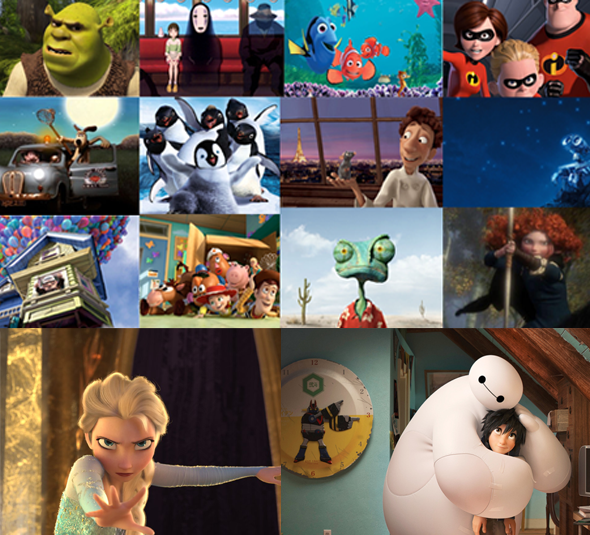 After all, winner or not all these films can lay claim to the title of Best Animated Feature Nominee forever more. It's for this reason I was not able to agree with all the teeth-gnashing about the snubbing of the Lego Movie- I was too thrilled that the lesser-known duo had received the recognition. This is perhaps one competition that it truly is not the winning, but the taking part. If Big Hero was indeed the "safe choice", it's remarkable that animation is now in such a place that a film that has such sophisticated and mature themes can now be considered as such. I reject the idea that it won just because of the name attached, but it's hard not to feel that it probably didn't hurt much either. Because it's never too early to start speculating, where will next year's ceremony hold? 2015 will see two Pixar films and no Disney at all. Will both Pixar features make the cut? Will they split the vote and cancel each-other out? We'd expect nominations for Minions and Shaun The Sheep but what will be next year's dark horses? Maybe GKIDS will do it again with The Prophet or Ghibli's When Marnie Was There. It's sure to be another exciting year for animation- same time next year?